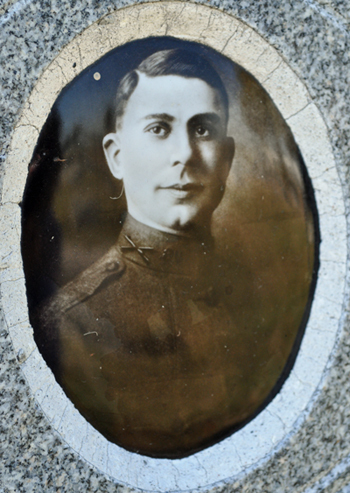 Anthony Joseph Caito, photoceramic on his tombstone, Mount Calvary Cemetery, Columbus. Anthony Joseph Caito was the son of Gatano/Gaemtino and Mary Caito. He enlisted to fight in World War I in July 1918. By October of that year, he was dead. He was just 23 years old. Anthony (or Tony, as he was called in the 1900 and 1910 census) reported for basic training at Camp Sherman in Chillicothe, Ohio. Camp Sherman opened in September 1918 in response to the rapidly-growing need to train Army recruits. The camp was the third-largest in the country and had more than 1,300 buildings, including barracks, a hospital, and a library. The Ohio Historical Society refers to it as “a small city.” Indeed, Camp Sherman nearly quadrupled the population of Chillicothe. Tony arrived in Camp Sherman in the summer of 1918. Something else arrived at camp shortly after that: the Spanish influenza. The flu swept through the camp. Eventually, Camp Sherman was quarantined to prevent the illness from spreading further into Chillicothe. Almost 1,200 men in Camp Sherman died from the flu. Anthony Joseph Caito was one them. He died 11 October 1918 and was laid to rest in Mount Calvary Cemetery in Columbus. Anthony Caito tombstone, Mount Calvary Cemetery, Columbus. Photo by Amy Crow. Caito, Anthony death certificate, #39698 (1918), viewed on FamilySearch.org. 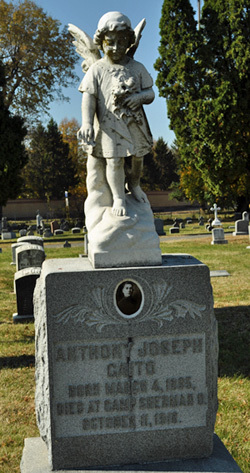 Caito, Anthony Joseph, tombstone, Mount Calvary Cemetery, Columbus, Ohio. Photos by Amy Johnson Crow. Ohio Historical Society, “Camp Sherman,” OhioHistoryCentral.org. Ohio Historical Society, “Marker #7-71 Camp Sherman,” RemarkableOhio.org.